Schumi0101: Bangalore to Pune in Airavat ‘Truck’ Class…!!!! Bangalore to Pune in Airavat ‘Truck’ Class…!!!! 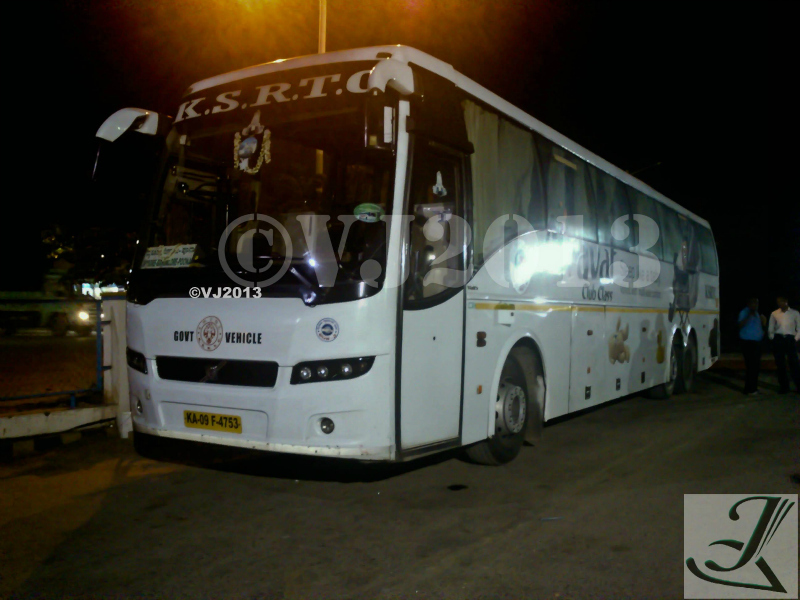 Service- KSRTC Airavat Club Class. Almost a week ago my plans for a packed weekend were done. A visit to Mumbai for a personal work, followed by a visit back to Pune to attend my friend's engagement and finally back to Mumbai to visit my friend was on the cards. I was very much looking forward for this trip as it was going to be my first trip of this year. And given the work timings, Airavat Club Class was the order of the day. I was rest ensured, this was indeed going to be a fun filled ride but little did I know there were surprises waiting to unfold throughout the journey. According to my plans, I was to take the 17:30hrs Airavat club class to Pune (Mysore-Bangalore-Pune) service and then later catch a Shivneri to Mumbai. With all plans set and done, I arrived at KBS straight from work at 17:35hrs and headed out in search of my bus. I reached the platform to see my bus backing up towards the platform. The bus had around 5 passengers who were traveling from Mysore to Pune and rest all were boarding from Bangalore. Being a Friday, I was expecting the bus to be full, however it was relatively empty. The conductor allotted seat no 2 to me and with all passengers onboard we were all set to depart. However a passenger was yet to turn up. The conductor called up the passenger and the passenger said he needs another 30mins to reach KBS. The conductor replied back stating the bus was already running late and he can't wait that long. He suggested him to board the bus along the way near Navrang signal. Finally, the bus moved out at 18:15pm. The bus had around 5.5lac kms done on the odo. The conductor came out to issue ticket and handed me a ticket worth 1010rs. I was perplexed as the ticket to Pune costs Rs 1290/- The conductor realized his mistake and handed out the manual tickets for the remaining amount saying there was a glitch in the ticket vending machine. The bus slowly made its way through the traffic and was nearing Navrang signal however, there was no sign of the passenger. The driver who was coordinating with the passenger got irate and asked him to board the bus before it reached the next signal. To ensure the passenger could board the bus in the next signal, the driver drove the bus very slowly blocking the traffic behind. Finally he stopped the bus outside Orion mall for 15mins. The passenger showed up and we finally departed. The bus took the Yeshwanthpur-Nelamangala toll way and headed out of Bangalore. As the bus reached the Nelamangala toll gate, the crew started discussing their parcel pick up points. The crew was very concerned about the parcels and the rates to levy for the same. We were yet to reach Tumkur when the traffic on the highway came to a standstill. An accident on the highway ensured we wasted close to an hour. At this point of time, I got an opportunity to speak to the driver. I asked him if there was a need to wait for more than an hour for one passenger to board the bus when there were other Airavat buses for Pune. The driver said he was just trying to ensure he left no one behind. Finally the traffic cleared and we headed for our dinner break at Sira. Already running late by 2hrs, the last thing I wanted was a slow driver at the wheel. However the second driver took the wheel and ensured he drove the slowest bus on the highway. We went inside Sira town to pick up parcels. The parcel van was yet to arrive, they finally showed up and we moved on after wasting 20minutes. The bus slowly crawled back on the highway, and we kept on crawling. The bus did not even cross 75kmph on my GPS speed tracker in my cellphone. Somewhere near Chitradurga, an NWKRTC express bus overtook from the left and disappeared into the night. We finally overtook it after 20mins when it had stopped to drop some passengers. I finally decided to sleep, but the crew still went on loudly discussing about the parcel pick up point. The bus stopped near Davangere for yet another parcel pick up. We continued on and somewhere near Haveri, the 19:00pm Bangalore-Pune Airavat Club Class overtook and we still crawled on. We reached Nippani at around 5:00am and headed inside the depot for diesel. Finally our slow driver made way to the other driver. We came back on the highway and we started to speed up while I sunk into a deep sleep. When I woke up we were near hotel Natraj on the outskirts of Pune and the time was 9am, and within no time we pulled inside the parking lot of the hotel. While backing up the driver did not gauge the distance between the fence and the bus. Backed in a little too much and ended up cracking the rear bumper. After wasting a good 30mins at the hotel, we finally headed towards Pune with the slow driver at the wheel. Again the crew started their parcel discussions on their return journey while we went through the traffic filled streets of Pune. I felt I was traveling in a ‘Truck’ with the parcel discussions going on. After a grueling 16hrs, I was dropped off at Pune outside Swargate. The delay ensured I miss my appointments and cancelling my plans of visiting Mumbai and staying back at Pune. Will I take this service again..?? NEVER...!!! Right from the word go, the crew were never bothered about time maintenance. Was there a need to wait for a passenger for more than an hour when there were other Airavat buses heading to Pune..? I was once left back by the same KSRTC, when I turned up late by 8mins in Kundapur. What was the crew more concerned about..? Parcels or reaching Pune on time. Needless to say every operator emphasizes on parcel pickups along any given route however emphasizing on parcel pickup when you are already running late by 2hrs is ridiculous. Finally, why stop for a 30mins break when your destination is not even an hour way. After such an experience, I will now think ‘thrice’ before taking ksrtc services on this route again. Thanks for the post. Michelin Tyre are one of the best brands of tyres in the market. If anyone searching for Michelin tyres Pune then go for Shree Tyres. For more detail contact 8055678063. Thanks for sharing this information. Dental Treatment is cost effective / inexpensive in India. For ex. average root canal treatment cost in Pune, India is less than 200 USD (complete package, including the teeth cap fittings). In case you are travelling to Pune, India, then you can find verified and genuine patient reviews about Renowned Dentist in Pune & View all the details of top dentist in Pune.